Starbucks has won its battle to stay open in a conservation area in Brighton in the face of local opposition. The chain has been operating in St James's Street for more than a year despite being refused planning permission by the city council. But after a three-day public inquiry, a government inspector has given consent. 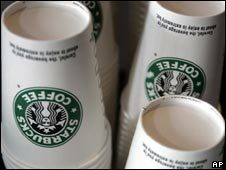 Campaigners said the decision was a slap in the face, but Starbucks said it was delighted to be able to continue to provide its experience to customers. One of the organisers of the protest, Green councillor Rachel Fryer, said objectors organised weekly protests. More than 3,000 signatures were collected on a petition, a Facebook group with nearly 2,000 members was formed and hundreds of people protested to Brighton and Hove City Council. "There are already 12 coffee outlets on St James's Street and traders are rightly worried that the new Starbucks will take business away from independent stores and eventually push many of them out of business," she said. "Local planning officers feel a new Starbucks will not add to the diversity and vitality of the area or encourage people to the street." The shop opened in St James's Street in May 2008 without permission to use the former bookshop as a cafe or restaurant. The council served an enforcement notice which allowed it to sell takeaway coffee and sandwiches, but they could not be consumed inside. A spokesman for Starbucks said: "We believe that Starbucks St James's Street coffee house makes a positive contribution to the local area. "We want to continue to play our part in the local community to ensure that the district continues to be the vibrant and attractive shopping centre that consumers and tourists enjoy."